An online cruising guide for yachts sailing around Australia. DST observed except for Queensland and Western Australia. Australia is both a continent and the world's largest island, with a landmass of 7,617,930 km2 (2,941,300 mi2). Surrounded by the Indian and Pacific oceans, Australia is separated from Asia by the Arafura and Timor seas. Australia has 34,218 km (21,262 mi) of coastline (excluding all offshore islands) and claims an extensive exclusive economic zone of 8,148,250 km2 (3,146,060 mi2) including some areas of the north-west continental shelf disputed by Indonesia. This exclusive economic zone does not include the Australian Antarctic Territory. The Great Barrier Reef, the world's largest coral reef, lies a short distance off the north-east coast and extends for over 2,000 km (1,240 mi). Mount Augustus, claimed to be the world's largest monolith, is located in Western Australia. At 2,228 m (7,310 ft), Mount Kosciuszko on the Great Dividing Range is the highest mountain on the Australian mainland, although Mawson Peak on the remote Australian territory of Heard Island is taller at 2,745 m (9,006 ft). Although boat ownership is widespread, most Australians don't travel much further than their local waterways, and marinas are often clogged with moored craft that haven't been moved in years. Added to this the tendency for local government to frown on living aboard and we have an environment that isn't really conducive to cruising. Considering the size and beauty of Australia's coastline this is tragic. On the other hand the Australian people are warm and friendly to travelers, and mostly disagree with the restrictions imposed, so you'll find assistance anywhere you go. The main route for visiting cruisers lies between Sydney on the east coast and Darwin in the north, from where a jump to Asia is usual. The Whitsundays in Queensland are a favoured destination, with protected reefs and islands abounding and very picturesque marine life. Those wishing to circumnavigate usually go anticlockwise, and provisioning on the west coast can be difficult. Fortunately this unspoiled area is teeming with fish and the many natural wonders make the journey more than worthwhile. An option often overlooked is to go south from Sydney to Melbourne and then on to the island state of Tasmania or — for the adventurous — going direct by following the path of the famous Sydney to Hobart yacht race held annually on Boxing Day (Dec 26th). From there a direct jump back to New Zealand's south island would be possible. Although best done in summer, Australia's winters aren't as severe as the northern hemisphere so even starting from Sydney in early autumn (fall) is a viable option. With 334 offshore islands, Tasmania could take years to see in its entirety. As a large continent a wide variation of climates are found across Australia. Coastal regions are the most populous since large parts of Central Australia are virtually uninhabitable desert. The north is hot and tropical, while Melbourne has a much cooler Mediterranean temperate climate. Western Tasmania has a climate similar to England, although Tasmania's capital Hobart is the second driest Australian capital. Temperatures in some southern regions can drop below freezing in winter. As Australia is in the southern hemisphere, the timing of the seasons is reversed with respect to Europe and North America. In other words, June-September is winter in Australia while December-March is summer. So Christmas actually falls in the summer in Australia, instead of in winter like in North America or Europe. See the various regions for local climate details. Ocean currents and ocean temperatures Bureau of Meteorology - "BlueLink". 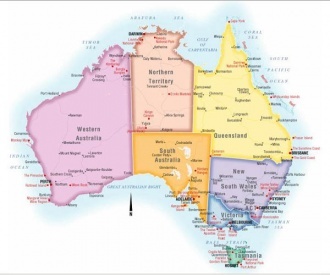 It covers all the coast around Australia, plus Australian territories (Norfolk Island, Cocos & Keeling Islands, etc). The area covered extends from the Solomon Islands to Java in Indonesia. Seebreeze A funky site that gives graphic presentations of the predicted wind direction & strength, wave height & direction, and tides and moon phases hour by hour for the coming 7 days. eg. Sunshine Coast (N of Brisbane) - is designed for windsurfers and kite surfers, but who cares. 0100 - 21.185MHz - Controllers in WA, SA. Relays in WA, VIC, QLD, NT, Philippines, PNG and NZ. 0200 - 14.116MHz - Travellers Net - Based in Western Australia. Relays in NSW, VIC, SA, WA and TAS. Callback time 0300. Net controller: VK6BO Roy. 0300 - 14.300MHz - Pacific Seafarer's Net - Covers small boat sailors in the Pacific. Collects position and weather reports daily at 0325 UTC after informal 'warm-up' session. 2040 - 7.087MHz - Comedy Net - Australia to Southwest Pacific. Very informal, multi-purpose with position reports, Wx reports and local inter-yacht traffic. Net control rotates amongst members and has many shore-based regulars who help with local knowledge. 2100 - 14.316MHz - Tony’s Net - South Pacific, Aust & NZ. 2200 - 21.412MHz - Pacific Maritime Mobile Service Net - Pacific/Worldwide. 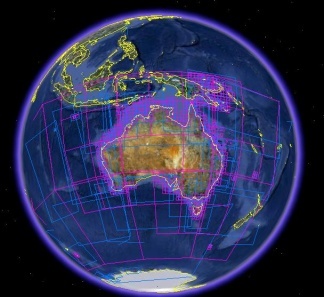 The VKS737 network is primarily designed as a safety and emergency network for remote travelers (4WD and so on) but the first two channels should be noted as they are useful as a direct link to the Royal Flying Doctor Service in a medical emergency, especially where regular marine channels are not eliciting a response. Regardless of the above, the cruising yacht should always carry a 406 MHz digital EPIRB (Emergency Position Indicating Radio Beacon) and this is now mandatory for any yacht sailing further than 2NM offshore. Older devices on 121.5MHz are no longer monitored. The following information was provided by Australian Customs regarding arrivals. "The Master of a vessel arriving in Australia is required by law to give notice of impending arrival NOT LATER than 96 hours before arrival. Customs does realise that not all vessels are fitted with the latest communication equipment. For these vessel this requirement seems to cause confusion as people interpret it as notification must be given 96 hours prior to arrival. This is not the case. This is the minimum requirement. I'll explain this with an example below. Example: A vessel is travelling from USA to Australia. The time frame is one month. The Master could report his impending arrival to Australia prior to departing USA. This would mean that he gives 1 months notice which meets the above criteria. Other alternatives is the Master could report his impending arrival from one of the ports he stops at on his way to Australia or prior to his departure from his last port before arriving in Australia. This may even be a week prior to his arrival, as long as the estimated sailing time is a minimum of 96 hours. Again this meets the above criteria for reporting to Customs." Be warned that the 96 hour advance notification rule IS enforced. Yacht owners have been prosecuted for not complying, resulting in a criminal conviction, a fine, legal expenses and delays. The details of all people aboard incl. name, date of birth, nationality and passport number. Details of any illnesses or disease recently encountered. If you have any animals on board. If you have any firearms on board. Customs does not have access to SSB/HF radio communications. The preferred radio communication is through VHF. If by chance the vessel arrives prior to lapsing of the 96 hours of arrival it can wait out the time anywhere it is safe to do so. If due to dangerous seas or a medical emergency landing earlier is necessary, then the vessel is able to progress to a safe haven or the Boarding Station. All that is required is that Customs is informed at the first possible opportunity. The 'Q' flag should be raised upon entry into the port. Customs, Quarantine and Immigration clearance must be completed prior to going ashore. Please stay on board. No persons other than a Quarantine or Customs officer is allowed to board your craft, nor can any person, animal or article leave the craft until you have been given full clearance. Depending on your arrival time, Customs and Quarantine may require all persons to remain on board overnight before clearing you the following day. Don't throw any waste or foodstuffs overboard while you're in Australian waters or while you are moored. Use designated quarantine disposal points. Don't trade foodstuffs with other overseas vessels. To go ashore without prior clearance is an offence. Contact with other vessels in port prior to clearance is also prohibited." Vessels arriving in Australia or sailing within Australian waters should be aware that Customs aircraft (commonly known as Coastwatch) may overfly at low levels and query their identity on VHF channel 16, and therefore this channel should be monitored. Tourist visas allows people to visit Australia for holiday, sightseeing, social or recreational reasons, to visit relatives, friends or for other short-term non-work purpose. Tourist visas are available for a stay of three, six or 12 months. Once in Australia, visas of three months or less can be extended to a maximum of six months. Visas are also available for working holidays (18 to 30 age group only), retirement (over 55 only) and for people traveling to Australia for medical treatment. There are also special visas for professional visits (cultural, social or research), students and workers with specific skills. Citizens of Kiribati, Papua New Guinea, Tonga and Vanuatu who have been invited by an Approved Employer may enter as Pacific seasonal workers. Special category visas are available on arrival to holders of a New Zealand passport. In most other cases a Visa or Electronic Travel Authority (ETA) must be obtained before entering Australia. For further information see the Dept of Immigration and Citizenship website. Brunei, Canada, Hong Kong SAR, Japan, Malaysia, Singapore, South Korea, United States of America. European (including UK - British Citizen) passport holders should use the eVisitor service instead. Holders of UK British National (Overseas) (GBN) passports are not eligible to use either ETA or eVisitor systems and should contact their local Australian Embassy. Both the ETA and eVisitor systems limit the duration of stay within Australia to three months, although they do allow multiple visits and are valid for 12 months from the date of issue. For longer periods either apply for a regular Visa from outside Australia, or apply for an extension (to six months maximum) after entry. IMPORTANT: Electronic entry is for tourists only. If you intend to work you will need to apply for the visa at an Australian Embassy. Australian Customs have the reputation of being one of the most difficult customs agencies to deal with world-wide, and recent media attention appears to indicate that there is some justification for that. Visas are generally not available on arrival, for either the vessel or its crew. See the Immigration and Visas section above for more information. Depending on the port of entry, customs/quarantine officers are likely to want to board and inspect the vessel before it ties up to any berth. Phone the customs officials at the port of entry to request directions (once again, most of these officials are not available on either VHF or HF, although Marine Rescue or the equivalent other state organisation can potentially provide some information). Extensive and expensive fines and other action, potentially including deportation, can be meted out for failure to meet all of the checking in requirements. Notify the customs office of your intended port of departure at least a few days before intended departure. Often the best way to do this is to attend the customs office in person. This will be required of all crew members, to present passports and fill out the necessary paperwork. On the day of departure or the day before, notify customs again and they will visit the vessel to provide outbound clearance. This page can provide some guidance. If you have animals aboard you may ONLY anchor out (not allowed to tie up at a marina or dock), and the animal must be kept on board and confined (in a cage or below decks) at all times. Quarantine must be notified of your intention to change mooring at least 48 hours prior to moving, as well as the proposed itinerary in Australian waters. Permission to go to a dock to take fuel or water must be obtained in advance. While at the dock, the animal must be locked below. Permission must also be obtained before sailing to another area. The boat must be locked up whenever the crew is away. If embarking animals in Australia, they must have a health certificate issued by a veterinarian. Regular inspections are carried out at the yacht owner's expense (very costly) and moving the animal ashore into quarantine is also a very costly and difficult experience. (Note: Delatbabel 10:51, 30 September 2013 (BST) -- I no longer believe the above to be correct provided tha the animal has a valid vaccination certificate or PETS passport. This is as a reminder to myself to check the above details with customs at some point). Australia's life expectancy continues to increase according to the 2010 health report of the Australian Institute of Health and Welfare. Women are expected to live up to age 84 while men are expected to reach age 79. Despite the high life expectancy, Australians still suffer from major diseases like cancer and heart problems. Fortunately, Australia has effective health care systems, both public and private. The public health care system is paid for by taxes and is run by the government through Medicare. The private health care system consists of the private hospitals, other health providers like dentists, health insurance companies, etc. Unlike the USA, Australians are not permitted to own guns except for sporting purposes, and the conditions of ownership are very strict. They must be kept locked at all times when not in use, and ammunition stored separately. In country areas this is somewhat relaxed, and twenty-two gauge rifles for rabbit shooting are the most likely seen, although this also is becoming rarer. Since the New York 9/11 tragedy Australia's security measures at airports have been stepped up severely, and due to the constant arrival of asylum seekers (aka "boat people") Customs have increased coastal surveillance to nearly Orwellian proportions, with local craft often queried and boarded in Australian waters for no good reason. Such is the price of security. Although there are venomous snakes and spiders in Australia, the only land-based predator to man is the crocodile which can be found in some northern regions. Oh yeah, and the water buffalo up north can be a bit grumpy, but they're an introduced species and mostly docile. Examples of terrorist activity have also been extremely rare. In general, Australia is a safe country in which to travel. Ashmore and Cartier Islands — uninhabited. The Ashmore Reef is overseen by a resident warden under the National Parks and Wildlife Conservation Act 1975, and permission to land must be sought by radio from the caretaker vessel. Private vessels are ordinarily permitted to anchor and obtain fresh water from the pump on West Island. Commercial vessels must be in possession of a Commercial Permit at a cost of $2000 per annum (1997 prices). They are also required to be under Australian Marine Safety Authority (AMSA) survey. Cruising yachts should not attempt to land on Cartier Island due to unexploded ordnance left over from WWII. Indonesian fishermen are commonly seen in the area, which is a traditional fishing ground. Australian Antarctic Territory — not exactly a cruising destination. Coral Sea Islands — only Willis Island is inhabited (by a small weather station). Heard Island and McDonald Islands — subantarctic, uninhabited. Some volcanic activity. Macquarie Island — subantarctic research station, part of Tasmania. For offshore islands and state protectorates, see individual regions. Whitworths. Stores in all states except Northern Territory. Has mail order catalogue & online store. Will post goods to Asia Pacific area. Historical sidenote: Whitworths (originally Miller and Whitworth) was started as a Sydney sailmaking business in 1962 by Craig Whitworth and Bob Miller. The latter left for London in 1974 to be closer to the international yacht design scene, and went on to win the 1983 America's Cup with John Bertrand at the helm of his winged keel design "Australia II". By that time he had changed his name to Ben Lexcen. Bias Boating Stores in NSW, Queensland and Perth. Has mail order catalogue & online order form. Appears to only post goods within Australia. BCF General purpose hardware, also refill LPG bottles. Much cheaper than Europe, but more expensive than the USA. Australia's water quality is very good. Fluoridated supplies in major cities, tank water in country regions. Australia has good broadband internet in all major cities, and plans are in progress to implement a home gigabit speed fibre-optic system in the near future. Open wireless networks should be readily found near to shore at major cities, and many cafes have wireless hot-spots available. While ashore you can also use the free facilities—including hardware—at public libraries, even in small towns. See also Indian Ocean Passages. Buy particularly volume 2 Ports and Anchorages. This is the authoritative guide to the Whitsunday Islands, a popular cruising and chartering area in Queensland. AFLOAT Magazine One of Australia's leading boating publications, and is often read by the cruising and racing yachting fraternities here. It is available for free from most boating outlets, book shops, and marinas.